Two going on twenty. 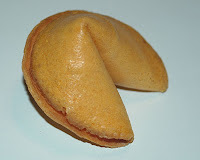 : Which came first, the cookie or the fortune? I was pacing in my cube at work, and I stepped on the corner of a bag. I think, "Oh no, what did I break now?" I look in the bag and find a fortune cookie from a lunch I ate last week in a pile of crumbs and the little white paper sticking out of the pile. I, of course, pull out the fortune. You will find your lost item within the next week.